Unofficially hailed as Heart Attack Alley, the Stampede midway is well known for its offering of mostly delicious, and sometimes incredulous, deep-fried foods. 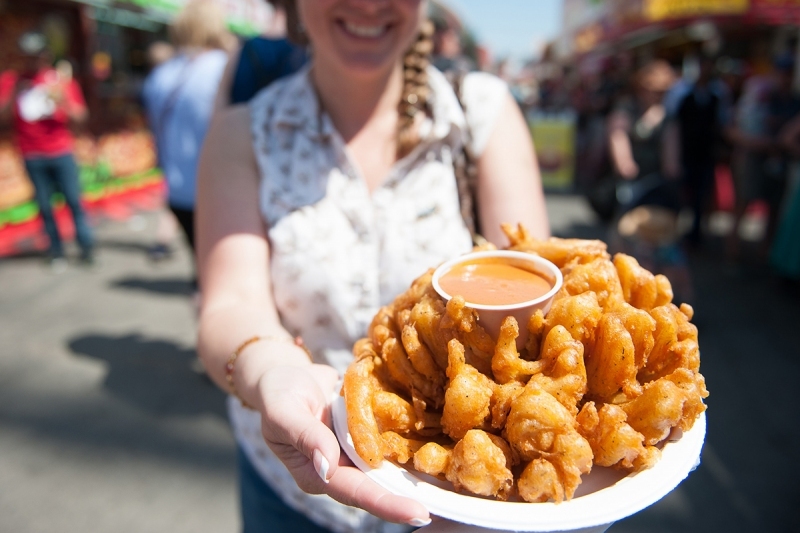 From classic corn dogs and mini doughnuts, to more… interesting dishes like this year’s giant-squid-on-a-stick and cheesy chicken hearts, the line-up of deep-fried foods at the Stampede never fails to satisfy the more than one million cowboys and girls that scour the park each July. In its commitment to providing Stampeders with the most amazingly greasy food around, vendors on the grounds go through tons of cooking oil – literally. In total, 15.5 metric tonnes, or 15,500 litres, of used cooking oil was collected from the grounds during the 10 days of the 2017 Stampede. For comparison, Stampede Park over the entire 2017 year collected 18.09 tonnes of used cooking oil. Oil in this amount can clog more than just arteries – when not disposed of correctly, it can also clog the city’s sewers, potentially causing costly damages and environmental pollution. Most people know not to dump any oil down the kitchen sink (or any other drain), unless they’re ready to deal with backed up pipes and the plumbing bill to go with them. If you’ve ever witnessed the havoc dumping cooking oil down the drain can cause at home, you can imagine what draining over 15 tonnes of cooking oil could do to the city’s pipelines. This is why the Calgary Stampede invests in having all cooking oil used in the park collected and recycled. “[Collecting and recycling used cooking oil] is one of the many programs at the Stampede that helps divert waste from the landfill, or in this case, potentially down the drain,” says Austin Lang, an environmental consultant with the Calgary Stampede. By ensuring cooking oil used at Stampede Park is disposed of correctly and recycled, the Stampede does their part in keeping both the city and the environment clean. When oil used in commercial amounts, like at the Stampede, restaurants and hotels, is simply tossed down the drain, it eventually solidifies in the sewers, clogging city pipes and causing overflow onto the streets. While Calgarians are known to be down for roughin’ it, walking through – and not to mention smelling – sewage in the streets is a hard line nobody wants to cross. And if overflow reaches any rivers or lakes, the pollution can be detrimental to the surrounding environment. Beyond preventing sewage overflow, the collected and recycled cooking oil plays an important role in protecting the environment. Both recycling efforts, for feedstock and biofuel, help minimize our impact on the environment by reducing energy and water consumption. Recycling used cooking oil into biofuel is an especially helpful component as it provides a more eco-friendly alternative to fossil fuel, which is one of the largest human contributions to climate change. So, when you head down to the grounds this year, feel free to enjoy all the greasy carnival fare the Stampede has to offer, while taking solace in the thought that, although it may be ruining your diet, none of that tasty canola oil will be ruining city pipelines or the environment.